The "Ion" is a small pen from Cross that can be carried in a keychain or a neck lanyard if needed. Some of the models actually include the lanyard. The Ion is a gel ink pen, this means the writing will be dark, smooth (very smooth) and will flow easily. It writes really well but the gel ink takes some time to dry so you have to avoid smears being careful not to run your hand over your writing. The pen is opened pulling the ends and closed snapping the ends it extends just an inch or so. The grip is very nice and the style is very suitable for pocket carry since it won't leak and you can't get stabbed because the pen is quite stubby. It's a thick and short pen so you will have to check it you like it for writing, not everybody likes the same style of pens and grips. You can get it in several different colors and styles and with several different ink colors from almost any office supplies store, you can read more about it in Cross website. 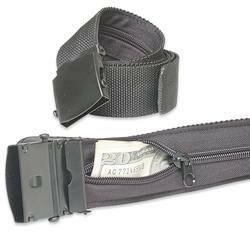 Belts with a hidden compartment are recommended to travelers to keep some money or valuable items in a secure way. As we all can realize they can also be used to carry some EDC items. This version in black has a zippered compartment in the inside of the belt that goes for about half the belt length so can be used to store a lot of things as long as they are flat. You can keep some money, bandaids, tablets or pills, a card sized multi-tool, a card sized knife, mini glow stickies, a very slim flashlight and many other items. It can be a good idea for a small emergency kit that you will only use in case of need. The model in the picture costs just $6 and can be ordered from this website. Cabelas has other models one in simil leather for more formal clothes for $25 and yet another model for $16. The TIC (Tactical Impact Cap) is an accesory bezel crown for some popular flashlights intended to add a defensive purpose to a traditional flashlight. 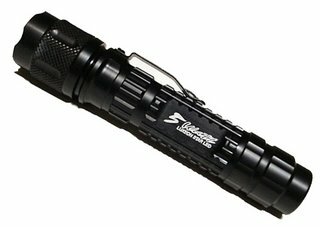 Surefire created this niche of flashlights with the E2D "defender" model, the idea is that you can use the flashlight to blind or disorient an attacker but you can also use it as an impact weapon in case of extreme need. When all this is not an issue the TIC is a nice decorative bezel and in some modesl is helpful to know if the light is on or off when you put it bezel down on a flat surface. The bezels are constructed in HA-III aluminium with a matte finish and a knurled body, they are attached to the bezel of a flashlight using 3 small screws, the screws might leave marks on your flashlight so have that in mind when trying. 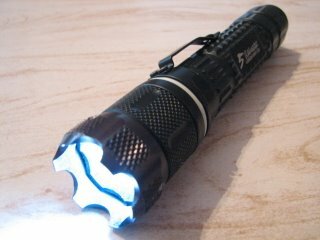 There are models for Fenix flashlights, Maglites and Surefire flashlights. Some of the caps work as well with other brands, for example in the picture you can see it in a Nuwai TM301X5 and the end result is great. You can order the caps starting at $25 from TAD gear. The TM301X5 is a 5 watt luxeon led flashlight from chinese manufacturer Nuwai. The light is powered by 2 C123A lithium cells. The body of the light is grade II anodized aluminium, not as strong as HA-III but strong enough to resist bumps, impacts and scratches. The bezel is slightly crenelated and can be used to know if the light is on or off when standing on a flat surface. The switch is a normal reverse clickie in the tailcap. 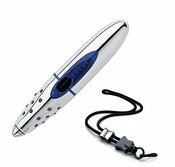 The flashlight features a pocket clip located aproximately in the middle of the body and it can be used to carry the flashlight bezel-up. The light has a strong flood-type beam this means a lot of sidespill instead of a long throw. It won't be very useful to point at distanct objects but can turn a room into daylight. The runtime is about 2 hours to 2 hours and a half with a fresh set of batteries and the light is really really bright, it may not look as bright as others because of the beam type but the amount of light it produces is really great. Point it to the ceiling in a dark room and compare it with other lights to understand the concept of "amount of light" vs "throw". This model can be get with a holder and batteries for about $65, check for availability at Lighthound.